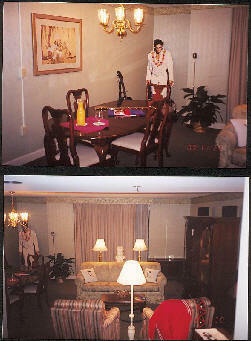 Daytona Beach Florida "Traveler's Inn at 735 N. Atlantic Av. 1-800- 417-6466" has an Elvis Theme Room but if you want to stay in an authentic Elvis Suite look no further than right here in Jacksonville Florida "Room 1010 at The Hilton Towers - The Elvis Suite" where Elvis stayed when he was in Jacksonville from 1972-77! I remember April 16th 1972 in the late afternoon when several people gathered in the parking lot below Elvis's suite hoping to catch a glimpse of The King! Well Elvis true to form came out on the balcony, looked down, waved and said; I'll be right down! He then threw his leg over the balcony in such a convincing way causing such hysteria that several women actually fainted! It was one of the funniest things I ever have seen! Elvis thought so as well, you could tell by the way he was laughing. It made the papers the next day! Another story goes that after Elvis had stayed in the Suite that the housekeepers or maids as they were called in those days would cut up Elvis's slept in sheets in 2 inch squares and sell them for a couple of bucks each! Recently when I stayed there I met a housekeeper who had been employed there at the time and she confirmed that the story about the sheets was true, she also shared many other story's with me making my visit not only an enjoyable one but an informative one as well! If you ever get to Jacksonville and stay at The Hilton, look her up. She is the head housekeeper, ask for her, she will make your visit to The Hilton extra special with her stories! Elvis performed here in 1975 April 25th at 8:30 pm at the Jacksonville Memorial Coliseum [that for what ever ridiculous reason the city is going to tear down soon] the show went like this; The opening acts, a comedian and members of show band doing a few numbers a brief intermission [I would guess so The Col. could sell some more Elvis Merchandise, "Total Saturation as he always put it"] then the lights went down! A rumble began as the musicians began to play the 2001 intro! The big super trooper follow spots (spotlights) were moving all over the coliseum, the music was blasting by this time! Then all the sudden Elvis appears out of what seemed from nowhere! The band kicked into See See Rider while thousands of flashes from those magic cube camera went off [ the col. Elvis' mgr. use to say he had the best light show in the business and he was right] for what must have been 10 minutes nonstop! It was blinding... Elvis began his second number I Gotta Woman/A-men where when he finished he slung his guitar 25 feet across the stage never looking back while Charlie Hodge snatched it out of the air [saying in an interview that he never once dropping it in all the years of working with Elvis]! By this time the audience was at a level of excitement that is indescribable! Elvis stops and says; “Ah, It's great to be in Tampa! (Laughs and says; just kidding Jacksonville”... talks a while then begins to sing the next song "Love Me" passing out scarves and getting the crowd right back into it! The next song is "If you love me let me know!" then "You don't have to say you love me" "Big Boss Man" "It's Midnight [current release]" "Burning Love" "Introduces the band while doing a medley of What'd I Say - Hail! Hail! Rock And Roll!" "My Boy" "[New Release] T.R.O.U.B.L.E." "I'll remember you" "Let Me Be There" "An American Trilogy" "with the house lights turned up Elvis sings; Ain't it Funny, How Time Slips Away" Says goodnight and goes into "Can't Help Falling in Love with you!" Exit music plays while Elvis leaves the building and that's just what he does jumping into a car and leaving right away to avoid any delays! That was a super show, Elvis wore a white 2 piece suite with turquoise and gold embroidery on the shoulders and down the side of the pants [in 1975 he had several outfits like this in different color schemes, this in my opinion was the prettiest] see photo! Important dates for all concerts in Jax Fla were as follows; The First Appearance was on May 12th 1955 Thursday at 8pm. as it was billed in "The New Ball Park"! Many argue that this was Wolfson Park! I don't know? Elvis himself said in the Film "Elvis On Tour-1972 and This is Elvis-1981" while riding over the main street bridge; Is That The Gator Bowl? probably referring to this performance where on the next night May 13th 1955 Friday at 8 pm his second performance in Jacksonville, Florida and for the first time in his career! Elvis was quoted as saying to an Audience of 14,000 plus after his performance; "Girls. I'll see you backstage" creating a full scale riot! The first of which all his cloths were literally torn from his body! They had to take him away in a police paddy wagon for his protection! Elvis was quoted many times referring to this incident; "They didn't really want to hurt me, they only wanted a piece of me for a souvenir" laughing. Advance tickets were $1 and could be purchased at McDuff Hardware Stores and The Dixie Music Shop between 11 am and 5 pm! Reserved seating was available but extra! Regular price was $1.25 at the door. Note; this show is where the Col. Tom Parker was sold on the market value of Elvis and decided to manage him! 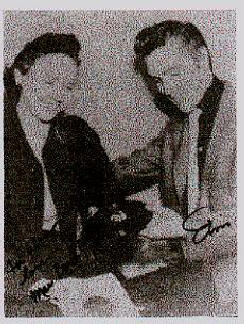 A deal was made August 15th 1955 for the col. to be his special advisor then on March 15 1956 it became officially "Elvis and The Col." Mae Axton who lived in Jax at the time and was a teacher at Paxon H.S. was responsible after getting a call from Elvis's then manager Bob Neal asking; if she could slip Elvis in the program and she did, getting Elvis on the program! It was at this show she told Elvis she would write him a #1 million selling hit while he had fried chicken at her house! She worked with the Col who at that time was Hank Snow's manager! And this was His show... Note; Wolfson park officially opened in 1955 on June 2nd. it was the new ball park! I personally don't think it was ready in time and the show was moved to what was then called "The Gator Stadium Baseball Park!" which makes since to me! The advertisement doesn't necessarily represent where the concert actually took place, just when it was! I've heard too many interviews including Elvis and Mae Axton clearly saying it was at the Gator Bowl not Wolfson park! Elvis was paid $50 dollars out of the $2250 the Col. made for this show! The next appearance was on July 28th at 8:15 pm on Thursday with The Andy Griffith Show! in 1955 just a few months later and was definitely at The New Baseball Park or Wolfson Park as it is called Today or will be for just a little while longer for it will be destroyed soon too in another mystery decision made by our local government! Anyway Tickets were $1 in advance $1.25 at the door and $1.50 reserved! The Doors opened at 7pm.! Gleen Reeves a local boy who would later record the demo for Heartbreak Hotel in Mae Axton's living room [the house is still there] at 3239 Dellwood Ave. here in Jax. was on the show! The Demo still exists today! Buddy Killen of Tree Publishing has it in Nashville, I use to date his daughter! I spoke with Glenn many times before he passed away about this among other things concerning his part in the history of Elvis! He had a booking agency here called Mellojean at the beach or Jacksonville Beach as it is called! The Friday show the next night July 29th 1955 at 8:15 pm. caused another near riot! Again getting most of his clothes torn off!!! Not missing an opportunity, The Col. presented Elvis with a new sport coat to replace the one that was torn from his body! Next important event to take place in Jacksonville Fla. is as mentioned above "Heartbreak Hotel" Where Mae Axton [who is by the way, wife of Hoyt Axton the actor from The Movie Gremlins & many others films, MaMa] who along with Tommy Durdin wrote the song shortly after Mae promised Elvis she would write him a No.1 hit record which as promised she did! The story of the song goes as such; Tommy spotted an article in The Miami Herald in 1955 about a John Doe [a person of unknown identity] who had sadly committed suicide in a hotel leaving only a note that read "I walk a lonely Street" continuing on... To which Mae replied; how sad the story was. Saying; The man died of a broken heart! Which lead to them writing the song in less than 30 minutes! Mae took it to Nashville to play it for Elvis at the annual disc Jockey convention! Elvis loved it, promising he would record it at his next recording session and he did Jan.10th 1956, the rest as they say is history because on January 27th 1956 it became Elvis's first #1 hit record and Million Seller just as Mae Axton had predicted right here in Jacksonville Florida! Just 7 months earlier! Chet Atkins who just passed away played the famous Guitar riff on the song! The 3rd time Elvis Returned to Jacksonville was February 23rd 1956 Thursday at 8:15pm! It was advertised at the New Baseball Park [probably Wolfson Park] and this time it was called, "The Elvis Presley Show"! Tickets were $1 in advance $1.25 at the door and 50cents for kids, with reserved seats extra! They were on sale at; DANESE Pharmacy at McDuff's Hardware located on Beaver St. and at Grants in the Record Dept. on Main and Adams St. It was after this show while Elvis was signing autographs that he Collapses! He was taken to the newly opened Baptist Memorial Hospital [which is still here] in what was said to be an "ice cream truck" of all things! I would guess to keep him cool from possible heat exhaustion! The doctor said; Elvis was doing as much on stage in 20 minutes as the average laborer does in 8 hrs. and advised him to slow down! He was kept overnight, I wonder what his room # was? hum! When released Elvis says; the nurses would not let him rest! Laughing as he leaves! Their was an article in the newspaper [Jacksonville Journal] about the incident Friday Feb.. 24th 1956! Elvis did the second of his two scheduled shows the next night, but with more vigor and energy than the night before and was quoted after the show saying he has no intention of slowing down. Elvis was paid $500 against 50% of the gate! 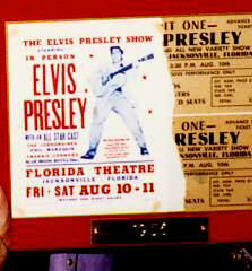 Elvis's 4th appearance was, "The World Famous Appearance at the Florida Theatre"! There were to be Six Shows on August 10 & 11th 1956 (3) per day at; 3:30 pm 7:30 pm & 9:30 pm! Tickets were $1:25 in advance and $1:50 at the door! This was to be Elvis's first inside show! The Florida Theatre seats 2,200+ and all 6 performances were sold out, for a total of over 15,000 tickets sold! Elvis was paid $1000 against an undisclosed percentage per day! Elvis mentions this incident during his famous Black Leather 68 comeback NBC-Singer TV Special! Where he mention's; "You remember that don't ya? With D. J. Fontana shaking his head! Elvis continues saying; Yeah, that's all I could move in Florida. Wiggling his little finger around while very briefly singing; You ain't nothin but a hound dog!" Laughing shaking his head probably remembering the thing with Local Juvenile Judge Marion W. Gooding who made national news when he threatened to arrest Elvis if he moved while performing saying; this savage and his music is undermining the youth of America! Elvis was very polite and respectful of the judge! But I was told privately he was put off about the whole incident! So Elvis stood on the stage and just wiggled his pinky finger through the whole show and the crowd went banana's, as to say; there you go! What's vulgar about that? It's funny compared to today and what's going on! Nothing happened except for the fact that the next time he was on Ed Sullivan they only filmed him from the waist up! But that was mainly from the Milton Berle show and the way he did Hound Dog during that performance! Also worth mentioning. During all this confusion, the national winner [Miss Andrea June Stevens of Atlanta Ga.] of the "Win A Date With Elvis" contest from Hit Parade magazine is flown into Jacksonville where he takes her of all places, " To The Krystal on 21 W. Adams St. for cheeseburgers" what a scream! 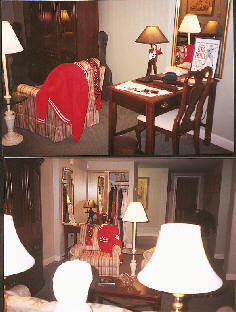 While in Jacksonville, Elvis stays at the Roosevelt Hotel 33-37 W. Adams Street which is currently vacant! They say it is going to be made into apartments and fully restored with no plans of tearing it down? The fifth visit was only when Elvis was passing through in 1960 after he got out of the Army! Elvis was to do a TV special on the Frank Sinatra show, his first live appearance since before going into the Army! He decided to take the train, which made 2 stops in Jacksonville coming and going! The first was March 24th 1960 where he greeted fans from the rear platform like a politician! Recorded the show at the world famous Foutainbleau Hotel where The Jackie Gleason Show was done, March 26th 1960! Returning to Jacksonville on March 29th 1960 on his way back to Memphis TN. The stops were as follows; Birmingham & Montgomery in Ala. Tallahassee, Jacksonville & of course his final destination Miami in Fla. Elvis Took "The Missouri-Pacific Eagle Train" out of Memphis TN. for this trip! The 6th visit, After 12 years Elvis Returns to Jacksonville and after 16 years to perform! It's April 16th 1972 on Sunday! Elvis is scheduled to do Two Performances, one at 2:30 pm and another at 8:30 pm. 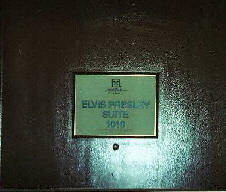 Elvis stays as mentioned above at the Hilton Hotel at 1201 Riverplace Blvd. here in Jax. 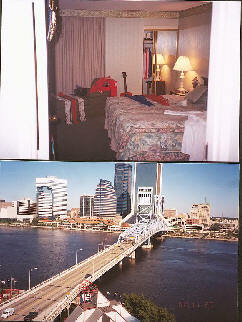 where he stayed all 4 times he came to Jacksonville in the 70's to do his shows! He stayed in room 1010! You too can stay there today for $350 bucks! Elvis wore the Same outfit that is pictured on the "Live From Madison Garden LP or CD" as a matter of fact, that picture was taken in Jacksonville not N.Y. City! 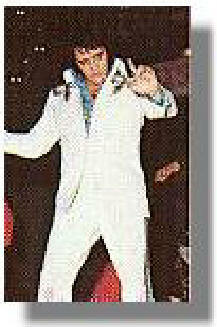 The reason being that Elvis looked tired in the photo's in N.Y. so realizing he wore the same outfit here and that promo shot's had been taken during the Jacksonville Fla. performance for a documentary that was being filmed, they decided to use the image from that performance for the cover photo! There were 9,258 according to the Jacksonville Journal in attendance at the afternoon show! Tickets were $5.00 $7.50 and $10.00 and were sold by Mail orders only! Both Shows were sold out long before the shows date! The evening show had an overflow crowd of more than 10,000! Elvis wore the Powder Blue suite with the white belt! He was filmed and much of the footage was used in the Film "Elvis On Tour" which was shot here and 4 other cities on this tour! The total attendance for both shows tops 19,000 and sets records for total attendance in a single day and the highest one day rental on the building in it's history! [ You may wish to call The Jacksonville Veterans Memorial Coliseum to see if the record's still stand today? I honestly don't know.] Something I do know, Elvis in his entire career never played to a less than sold out house! Amazing, a record that will never be broken for sure! Rick Marino takes pride in saying his home town is Jacksonville Florida and he lets us in on the many true accounts of one of Elvis’ favorite places to perform!